Pioneer compact car manufacturer Suzuki Philippines consistently breaks barriers with impressive sales performance for the first half of the year. Reflective of last year’s strong market performance, Suzuki Philippines Inc. (SPH) continues to impress the industry with yet another record-breaking growth. SPH posted strong sales for the first half of the year, achieving a 35 percent year-on-year increase on the back of effective brand-building efforts in numerous platforms, particularly in recent months. Continuous sales growth, successive openings of new dealerships in the country’s key cities and the launch of products designed to cater to different emerging markets – all these contributed to the growth of the company during the first half of 2017. SPH General Manager for Automobile Shuzo Hoshikura expresses his gratitude to the company’s loyal customers, “The milestones we have accomplished over the years, especially that of satisfying the need of Filipinos through our quality and fuel-efficient compact cars, indeed bring us joy and fulfillment. This is why we are constantly innovating so we can continue to deliver more improvements in our products and make Suzuki drivers happy,” he shares. Subcompact sedan Ciaz continues to be a popular choice among Filipinos, with sales growing by more than 400 percent compared with the first half of 2016. The vehicle features a stylish exterior and a powerful motor that make drivers feel a connection with their car. Its fuel efficiency ensures car owners of getting their money’s worth and having a driving experience unlike any other. 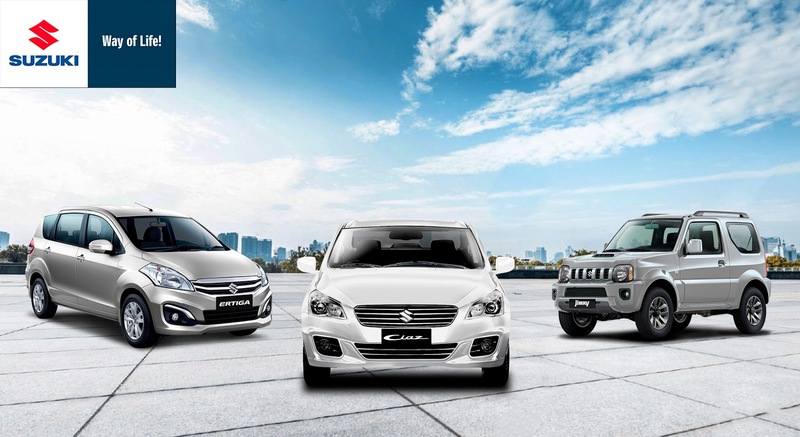 The Ciaz’s breakthrough sales were complemented by the strong performance of other Suzuki best-sellers to boost overall sales. The 7-seater Ertiga and 4x4 Jimny models achieved 70 percent and 36 percent sales increase, respectively, over the first half of 2016. Packed with a spacious yet cozy interior, the Ertiga life-utility vehicle serves as a great companion for trips with family and friends. It features a three-row layout to accommodate up to seven people and has adjustable seat slides to further enhance the riding experience. Meanwhile, the Suzuki Jimny remains a consistent market favorite. With its real 4x4 capabilities, drivers easily maneuver the Jimny no matter the terrain or weather condition. SPH continues its drive to bring the Filipino closer to the Suzuki ‘Way of Life’ with the opening of four new dealerships in the first half of 2017. SPH further strengthened its presence in the Philippine market with its new 3S openings in Ormoc and Tarlac and several Satellite dealerships in key areas, which includes Bonifacio Global City, SM Consolacion, SM Valenzuela and Kalibo to better support loyal Suzuki customers in these parts of the country. With these new dealerships, SPH is poised to finish strong by the end of the year. Besides remaining firm in its commitment to offer consumer-friendly and fuel-efficient compact cars for Filipinos, SPH is keen to continue growing the Suzuki family. SPH celebrated its growing foothold in the Philippine market with the Suzuki Car Clubs Thanksgiving 2017. The fun-filled event was attended by many of its loyal customers, including 170 key representatives from the Team Suzuki Philippines (TSP) Car Club, which continues to show steadfast support to their beloved car brand. Established in 2015, TSP is a nonprofit organization convened to foster camaraderie and support among Suzuki car clubs. The group now comprises nine car clubs — Team Alto Pilipinas, Team Celerio Philippines, Swift 1.2 Philippines, Team Swift Philippines, Team APV Philippines, Club Ertiga Philippines and Vitara Club of the Philippines, and the newly accredited Team Ciaz Philippines and Suzuki Jimny Club Philippines. SPH complemented its expansion and community-building efforts with CSR initiatives. The company partnered with Gawad Kalinga (GK) during the first half of the year, donating items to the GK SipaG football program to convey its support for kids engaged in the sport. Together with SPH’s previous collaboration with GK Smokey Mountain for the AFF Suzuki Cup 2016 and meeting kids from other SipaG teams, this indeed marks a strengthening partnership with Gawad Kalinga. “The successive expansions and continuous product development that we implemented throughout the first half of the year would not have been possible without the support of our patrons and customers. By adopting the Suzuki Way of Life, they continue to inspire us to double our efforts every step of the way,” says Suzuki Philippines Assistant General Manager Cecil Capacete.